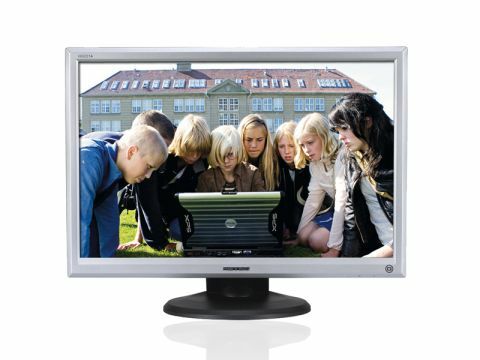 The HANNSG HG221AP is a 22-inch display with a single VGA connection. As there is only one connection you don't have the option of hooking up a games console or DVD player, so it's a dead cert that you'll be using the HANNSG with your laptop. Unfortunately, the results may not be all that pleasing, as the HANNSG is large enough to show the disadvantages of a poor analogue display compared to one that uses digital. Image quality is a mixed bag; for instance, the colours of the Windows desktop appear rich and vibrant, while the text of the icons is fuzzy. It's a similar story when you read black text on a white background, as the image fails to be sharp, crisp and precise and instead looks more like the output from a dodgy printer that's running out of toner. We also found that some Apple QuickTime HD movie clips looked surprisingly good, while others were slightly blurred. We then delved in the settings, which is a thankless task as the control buttons are hidden from view and are tricky to operate by feel. The four colour settings are warm, nature, cool and user-deﬁned and none of them were entirely satisfactory. We also tried the X-Contrast feature which takes control of the brightness and contrast settings and presents an image that can only be described as odd. The integrated speakers are so weak and underpowered that they detract from the experience of watching a movie, so we suggest you plug your headphones directly into your laptop. The strength of the HANNSG HG221AP is its incredibly low price, as it is a mere £116 at Amazon. If you hunt around at Misco, you'll ﬁnd the HG221AP described as the Misco Saver 22-TFT for an even cheaper £105, but remember, you've been warned.